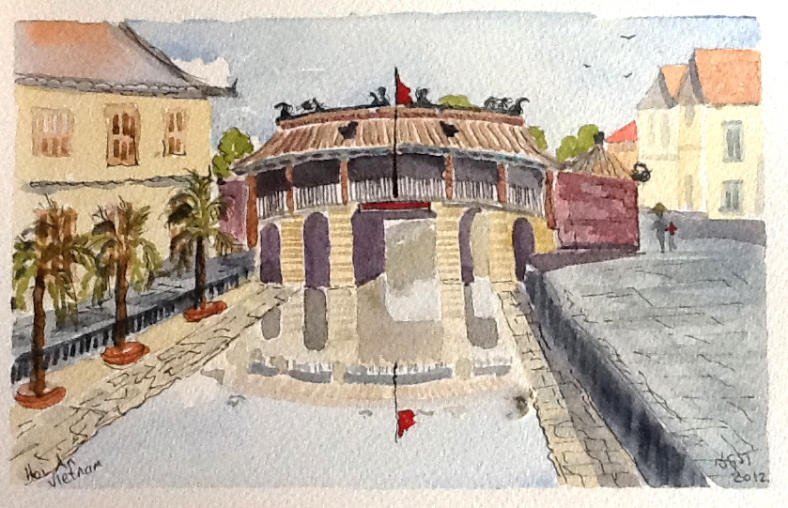 The Japanese bridge is the symbol of Hoi An. It is to Hoi An what the Statue of Liberty is to New York or what the Eiffel Tower is to Paris. We can see its illustration on the 20,000 VND note. We are not really sure about the exact age of the bridge. 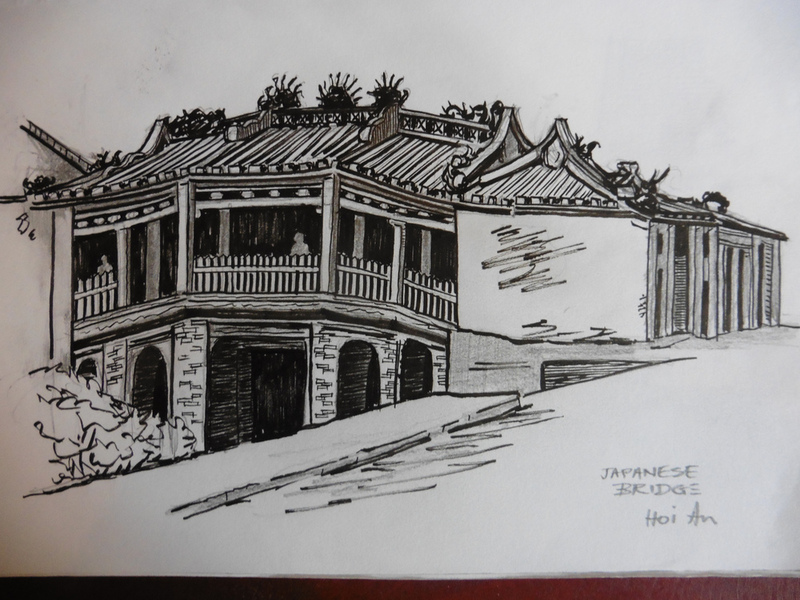 It is said to have been built in the late 16th, early 17th century in order to connect the Japanese district to the Chinese district of Hoi An. At the time these two districts were separated by a river, the Thu Bon River which passed at the foot of the bridge. Currently it’s connecting Tran Phu Street (the Chinese area) to Nguyen Thi Minh Khai street where the Japanese quarter used to be located at the time. The Vietnamese call this bridge “Cau Nhat Ban” (Japanese Bridge) or “Lai Vien Kieu” ( Friendship Bridge) or Chua Cau (Pagoda Bridge) . The Japanese bridge’s construction lasted 2 years. This humpback bridge is 18 meters long. It’s been restored four times since its construction; last time was in 1986. Many legends explain the presence of animals at the entrance and at the end of the bridge. The most popular one and certainly the most likely relates that the bridge’s construction started on the year of the Monkey and ended on the year of the Dog. This means that the bridge’s building started in 1596 or 1608 and ended in 1598 or 1610. Other legends exist about these statues: many Japanese emperors were born in the year of the dog or of the monkey and these animals would be part of a particular cult for Japanese. 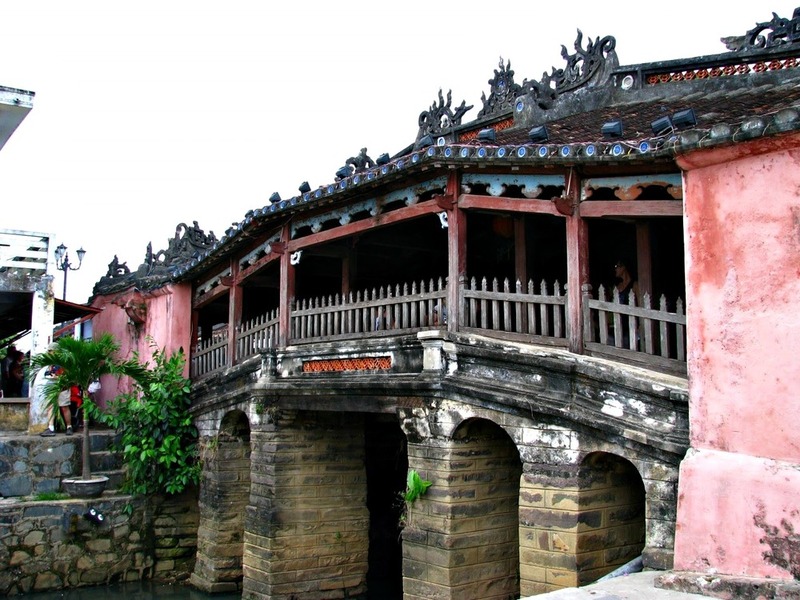 In the middle of the bridge we find a pagoda which was built in 1653 by the Chinese who had migrated to Hoi An  . 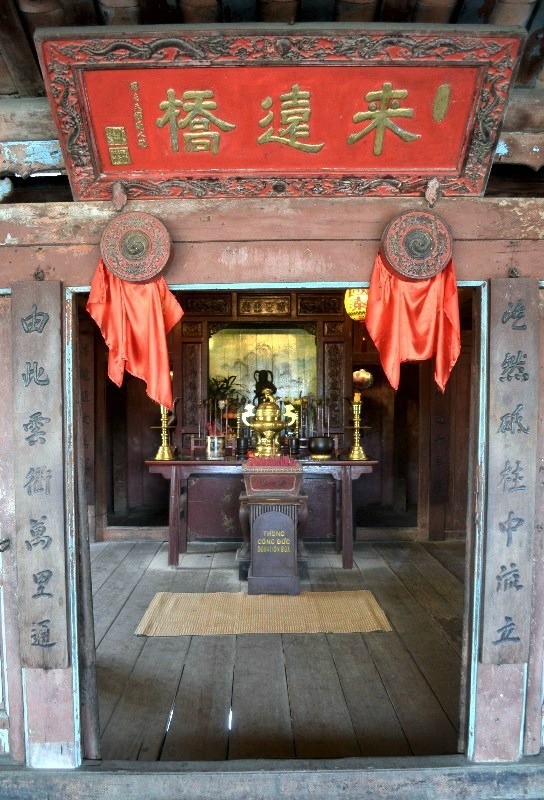 This pagoda is dedicated to the deity Bắc Đế Trấn Vũ  which is an important deity in Taoism. It protects the people from the aquatic monsters. As you may know it, Hoi An sits on low ground surrounded by waterways and mountain ranges, and suffers from tidal influence as the main river meets the sea and every year, the old town goes through big flooding. By the way, a legend says that these floods are caused by the presence of a gigantic monster whose head would be in India, tail in Japan and body in Vietnam (located in Hoi An). This is the famous Namazu. Each of his movements causes natural disasters in these 3 countries, such as earthquakes and floods, etc. To protect the city of Hoi An from flooding, the Japanese trading community built this pagoda for Bắc Đế Trấn Vũ in the exact location where the body of Namazu passed in Hoi An: under the Japanese bridge! The statue made out of jackfruit wood represents this divinity, Bắc Đế Trấn Vũ. In the past, the Chinese community used to organize rituals on July 20th of the lunar calendar in order to honor this god and to ask for his protection. 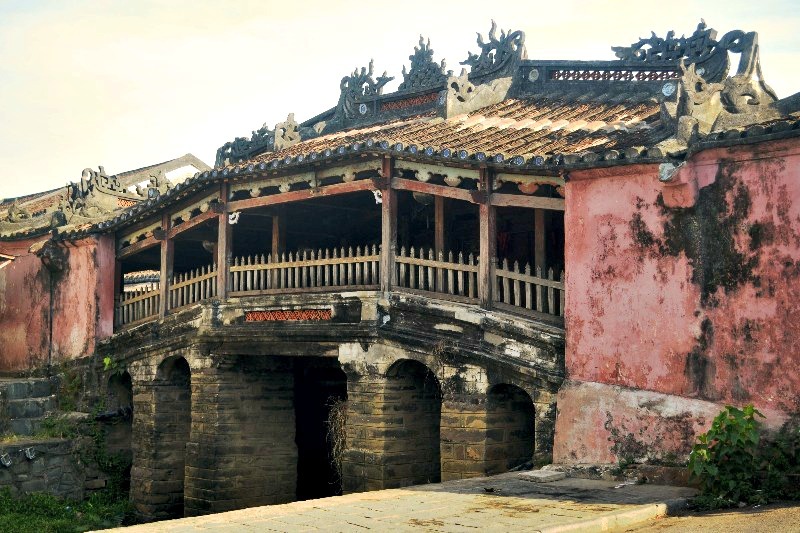 Currently, Hoi An residents come to the Japanese bridge to burn incense on the 1st and 15th day of each lunar month and also for the lunar new year (TET) to show their respect and dedication. These Chinese migrants had fled China after the takeover of the Ming dynasty which replaced the Qing. It is also called « Huyen Vu Thanh Quan », « Chan Vu ThanhQuan », « Bac Cuc Huu » or « Thanh Chan Nhan ». 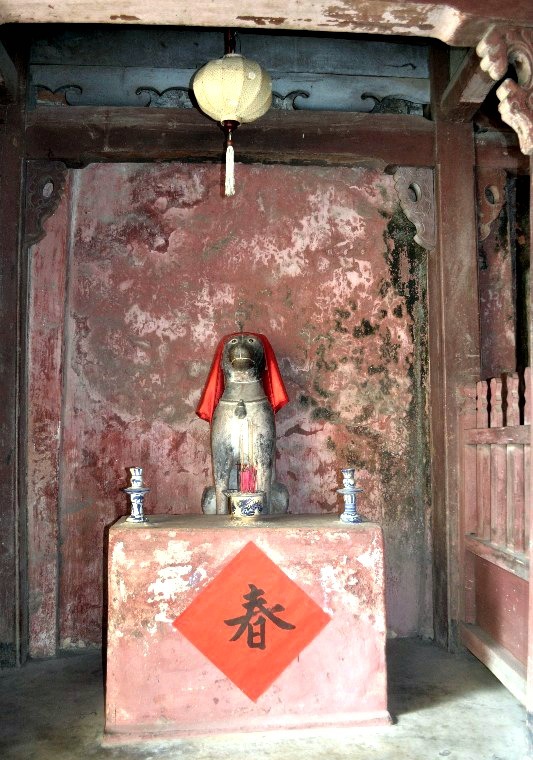 If you want to explore the Japanese bridge and explore the heart of the old city of Hoi An, book our self-guided tour and come investigate the Malediction of the Jiangshi!